So excited for this person! She is getting over 57 prizes! She was already notified because I had to check to make sure she had liked all the pages and followed my BLOG and she did! Check back because all next week I will have daily GIVEAWAYS up on my BLOG too! How cool is that????? What can I say people LOVE my fans! Congratulations!!! She's one lucky girl! The prizes are all awesome! Thanks to FT for the Giveaway! Congrats OH SUZANNA...that should make for 1 awesome holiday!!! 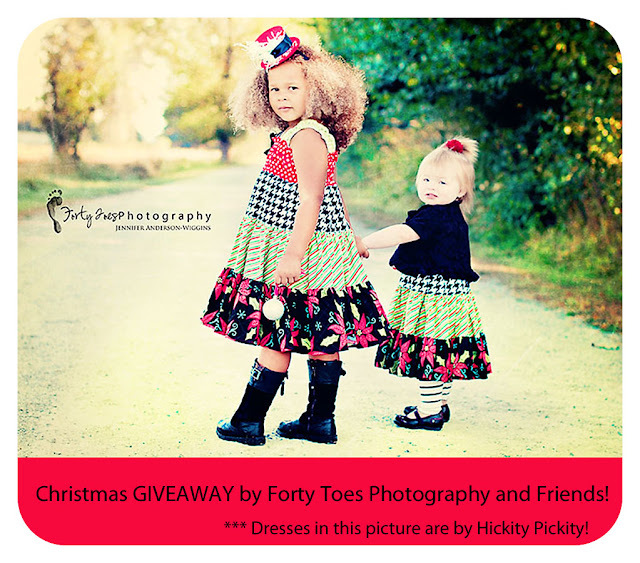 Enjoy and much thanks to Jenn of Forty Toes for being the awesome lady she is!! CONGRATULATIONS....OH SUSANNA PHOTOGRAPHY...AND THANKS TO ALL THE VENDORS YOUR WORK IS AWESOME...!! !AND THANK YOU FORTY TOES...AWESOME...HAPPY THANKSGIVING TO ALL..!! Congratulations to Oh Suzanna and family, Christmas came early:) and congrats to all of us for finding all these amazing boutiques. Thank you FTP for all your time and dedication in making such a wonderful giveaway. Congrats to the winner and her family! Congrats to FT for the Greatest giveaway ever! Happy Holidays to all!